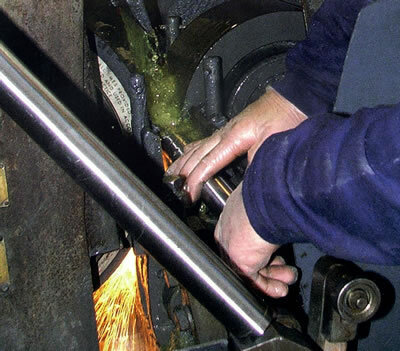 We are able to offer centreless grinding, both through-feed and plunge grinding. Through-Feed Grinding: Can be utilised for bars, shafts, and other components. Parts of more than one diameter can be ground using the through-feed process if the diameter being ground is the largest diameter on the part and it comprises the majority of the overall part length. If multiple diameters need to be ground on the same part, this form of grinding can often be combined with other grinding processes to carry out the customer’s requirements efficiently and cost effectively. Plunge Grinding: Is generally used for components that require grinding up to a shoulder or a larger diameter. The work-piece moves in axially between the grinding wheels, stops for the grinding operation, and then moves out again. Again this form of grinding offers the customer a cost effective, efficient service. 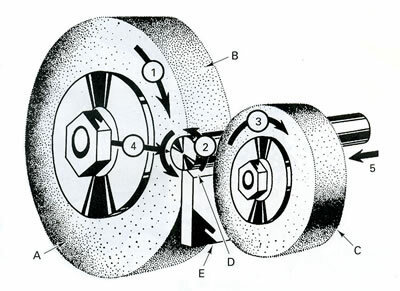 Principle: The principle of centreless grinding can be seen in the diagram below. Two wheels are used, the larger one operating at regular grinding speeds which does the actual grinding, and a smaller regulating wheel. The regulating wheel revolves at a much slower surface speed - usually around 50-200 ft/min, and controls the rotation and longitudinal motion of the work piece. For through-feed grinding, one or both wheels of the centreless grinding machine are canted out of the horizontal plane, this imparts a horizontal velocity to the work piece, so that outside feed mechanisms are not necessary. The work piece is held against the work-rest blade by the cutting forces exerted by the grinding wheel and rotates at approximately the same surface speed as that of the regulating wheel. Grinding: The grinding process is essentially quite simple. The component is passed through the centreless grinder where approximately 25-50µm is removed. The wheels are reset and the component passed through again. This process is repeated until the required size or finish is achieved. Cincinati 220/8 Centreless grinder up to 60mm dia. x 1800mm in length. Estarta 301 Centreless grinder up to 25mm dia. x 350mm in length.